Over the years, people suffering from fibromyalgia have been put on various drug related medical treatmentsto reduce the widespread chronic pain of fibromyalgia. Now, fibromyalgia patients have something new to look forward to. Released in 2015, the AVACEN is the world’s first medical device approved by the U.S Food and Drug Administration (FDA) for the treatment of widespread pain. Fibromyalgia patients typically suffer from joint pain, deep tissue pain, fatigue, depression, headaches and lack of sleep. What causes all the fibromyalgia symptoms is still a mystery. There are many medical treatments for fibromyalgia symptoms usig various types of drugs. However, Fibromyalgia patients can now treat the chronic widespread pain that the condition causes without using any kind of drugs. Advanced VAscular Circulation ENhancement (AVACEN), a medical device recently cleared by the U.S. Food and Drug Administration to be marketed for the temporary relief of joint pain. People suffering from fibromyalgia can fight chronic pain using a single convenient treatment point, the palm of the hand. 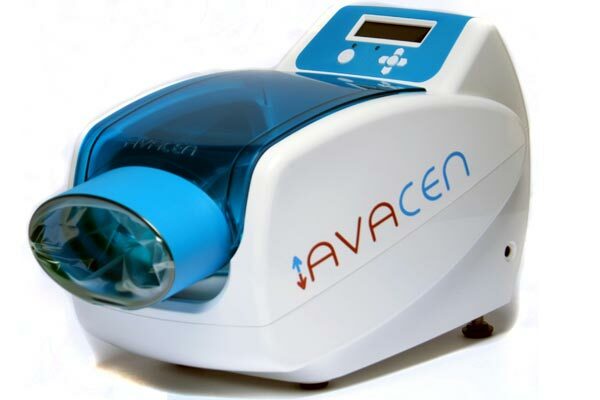 The company, AVACEN Medical, released the AVACEN 100 that is cleared by the FDA as a class II OTC (over the counter) medical device. The FDA also approved the medical device for treating joint pain, arthritis, muscle spasms, muscle relaxation, and minor strains and sprains. The machine can be used 10 to 30 minutes at a time to feel better. It combines heat therapy and negative pressure to give patients temporary relief from pain. Fibromyalgia is a medical condition that affects the muscles and soft tissues. It causes chronic muscle pain, fatigue, sleep problems, and painful tender points or trigger points, which can be relieved through medications, lifestyle changes and stress management. Genetics:This is because fibromyalgia tends to run in families and there may be certain genetic mutations that may make you more susceptible to developing the disorder. Infections: There are some illnesses that seem to trigger or aggravate fibromyalgia. Physical or emotional trauma:It is also believed that Post-traumatic stress disorder canlead to developing fibromyalgia and repeated nerve stimulation causes the brain of people with fibromyalgia to change. This change creates an abnormal increase in levels of certain chemicals in the brain that signal pain (neurotransmitters). According to AVACEN Medical, the medical device provides muscle relaxation without invasive treatments and treat pain without drugs or supplements. Patients put their hand into the device in a vacuum chamber. The hand rests on a pad that is heated. The device continues infusing heat into the circulatory system at normothermia. Infusing heat into the circulatory system reduces blood thickness (viscosity) and increases microvascular circulation. Thinner blood facilitates more efficient flow through the skeletal muscles on its route to the smaller vasodilated capillaries (microvascular circulation) that the body uses to radiate the excess ATM produced heat into the cooler ambient air. This increase in microvascular circulation enhances oxygen delivery and nutrition to the skeletal muscles while carrying away the toxins and results in significant benefits for arthritis and muscular relaxation. The AVACEN 100 uses heat therapy together with negative pressure to leverage the natural adaptations of the body. This heats the blood temperature ever so slightly and causes your capillaries to expand, blood pressure to lower, and you will feel more relaxed. Not many studies or trials have been carried out at the moment. However, there are a few studies or trials carried out which have shown positive results. In December 2015, ClinicalTrials.gov, a service of the U.S. National Institutes of Health published the results of the AVACEN Medical’s Fibromyalgia clinical trials. The 28-day AVACEN follow-up study reported a statistically significant reduction in thewidespread pain index and a decrease in tender point count to a level below the value typically used for theclinical assessment of fibromyalgia. The month long study took place at the University of California at San Diego and involved 22 fibromyalgia patients. The patients carried out a 15-minute treatment everyday. These results were derived from a treatment process that uses the palm to noninvasively transfer heat into thecirculatory system while the body is at normothermia (approximately 98.6° F). This treatment process is referred to the AVACEN Treatment Method. The study revealed that the patients reported a 40 percent reduction in widespread body pain. According to the AVACEN Medical CEO and inventor, Thomas Muehlbauer, these results can significantly improve the quality of life for fibromyalgia sufferers worldwide. The Company has already submitted the results or data of the study to the FDA to receive approval to market the device for relied of widespread pain associated with fibromyalgia. Currently, there are no known FDA approved medical devices that treat the chronic widespread pain as a result of fibromyalgia. In a similar pilot study, 14 fibromyalgia patients were asked to use AVACEN device.All 14 fibromyalgia patients used the device the twice a day. The results showed that 93 percent of the fibromyalgia patients reported a significant reduction in widespread pain. However, it is important to note that before starting any new treatment, one must consult your doctor. This medical device is not recommended for pregnant women and people under the age of 18. It is also cautioned for people who suffer from heart disease, blood circulation conditions or have a high temperature. While there are different types of medical treatment for fibromyalgia, AVACEN treatment does not use any kind of drugs. There are no known side effects of this medical device. The AVACEN 100 has a record of approximately 500,000 treatments without a single reported negative side effect. Would you be willing to send out for trial use and feedback ? I hate taking medication. Aif this is the answer …then I know many who will purchase. How do I get one of these ? This is a positive development if the device can have at least over 80% effectiveness. What I however, would have loved to know that is not in this article is the cost of the device or how expensive it is. I also hate taking medication, how do I go about getting one? Any info, trial use, option to buy? You can find it st avacen.com is over $2,000. Well it figures……..finally something that might work and it’s not affordable. I have used a similar product at my doctors place that sounds quite similar to this except it’s lazer. My thumb was soooo bad I couldn’t use it and had to wear a big ugly brace as not to move. It only took 3 treatments and now no more brace and no more pain. Wednesday I will start on both my ankles that are just killing me. I hope this new device works this well too. We have to keep reaching out for any new treatments that may bring relief. Sounds too hocus-pocus for me. Really and how much is this going to cost, I hate to say this but is it just for the select few who can afford this product and then the rest of us will keep suffering! They need more testing and not just in the USA! I would love info about this or to try it! My meds are not working. Can I be apart of the trail? I have SLE and Fibromyalgia. I would LOVE to try it, but money is a massive issue. How do we get Medicaid to pay for this? I haven’t looked through AVACEN’S complete site yet but i have NOT seen anywhere were it says its for fibromyalgia patients. Ive only seen were they say it is being used to treat Rheumatoid Arthritis patients. I’ll read more but this thing seems too new to know for sure as to whether it works for Rheumatoid Arthritis and fibromyalgia. How can I use it if I have tender point in the back or hips?! If it’s not covered by insurance it’s b.s. Other than heat, what does it do? Because I use heating pads all day every day. And that heat isn’t curing me! If there is a trial taking place in Columbus, Ohio, I volunteer! Have suffered from fibro almost 30 years, with each year getting worse. Like all chronic pain sufferers, begging for relief! I’ll bring chocolate-lol! I have had Fibromyalgia since 2009. Shouldn’t use if you have a high temp!! My temp is always higher than normal with Fibromyalgia so is it really suitable for this condition ? ? I would like to try this device too. How and where do you get this and how much is it ???? As someone who suffers so look much from fibromyalgia, I’d do anything to try your product. I would love to have a trial also I suffer from fibro ,neuropathy and rheumatoid arthritis and I am in pain every day all day and take nothing because I don’t have the money to buy meds all the time. I would also love a trial one. Insurance should cover this! Some will give some reimbursements for OTC. Please approve and send out trial ones! Many of us would be more than happy to provide great feedback!!! I would love to be involved in any future clinical trials as I’ve had Fibromyalgia for over 30 years. However, it has only been in the last 2 years that I have been experiencing severe pain and also numbness in certain extremities. In the alternative, is this product on the market? I would love to try this! I have been suffering for years on medication, epidurals, radio frequency ablations, trigger point injections, and so on. The side effects of these are miserable! I will like to know how can I try one.? Is it cover by insurance? Does rheumatologist or pain doctor have information about it? Is it covered by insurance and Medicare? Not much good if it doesn’t!!! Would love to try this! Does insurance cover any of the cost? Would like to buy one. We fibro patients try anything because this is a terrible disease. Please consider me for a trail!! I was diagnosed with fibromyalgia in 2006 and it’s horrible!! I would love to participate in a clinical trial & provide you with constant feedback on your new device. I have fibromyalgia, hypothyroidism and osteoarthritis, I also suffer from Low Vitamin D. My temp is usually always 97.2 If this helps any condition that would be amazing. Good luck to your company, I pray for good results with your new equipment. Please contact me should you require more test subjects. I can write a book about FM. I was born with it. I had an Aunt who had it and stoped going to school at the age of 11 years. Then it was known as rheumatism. I was saying to my aunt that I feel the same. Always in pain, and severe when I get my period every month. The period pain used to be like having a baby, severe pain. I always had sleep disturbance. Waking up with bad dreams. Now, I know a lot about FM. Now my daughter is complaining of pain in her ankles. Two of my aunt’s daughters have FM. I hope they soon find a cure for FM. cause I had to give up my desk job and I feel so down and depressed. I take 50 ml of Amitriptyline and when I have severe pains I take 100 ML of Amitriptyline. So I hope and pray they find a cure soon. I would love the opportunity to try this. I take too much medicine and after 50 years of pain and suffering I am desperate for some relief. If they are still doing trials I would be very Interested. Have fibromyalgia for about 20 years. I would love to try this. How do I go about getting one?? A long with a lot of comments I see … how does a person go about getting one? And what is the cost. My god this could be life changing for fibromyalgia patents, I feel disparate for a brake though. Please i want to be involved please. Oh my pain is out of control not 1 pill works, I would love to be picked to receive a trial Im not working and Im almost positive the insurance company will not pay. Just like everything else. Unless Medicare will cover most of the cost of this, I’m out. Is there no consideration for people on disability incomes? I’ve had fibromyalgia since I was a child and this device is the first hope for pain relief that isn’t the opioids I live on. Why offer a device as OTC knowing that almost no patients can afford it? This is like the Cephaly device that came out for migraines. However that device was around $300 so it wasn’t going to break the bank especially if it didn’t work. I don’t have $3000 to spare.